Solid surface material is an acrylic resin composite typically used as kitchen and bath countertop surfaces and shower wall enclosures. Corian® is the most well-known brand. It can be made to look like granite, quartz, marble, mottled glass, stainless steel and a host of other materials. New and creative applications for this versatile material include sign-making, window sills, gun handles, artwork, lamps, pen-turning, cutting boards, pen-making, guitar bodies, and much more. Solid surface is non-porous and resistant to stains and chemicals, making it a perfect fit for industries concerned with bacteria on medical facility surfaces and for food-preparation areas in restaurants and homes. Because it has the same color and pattern throughout, blemishes such as cuts, scrapes, and other marks can be removed with soap and water, mild abrasives, or by sanding (and buffing) so the surface is renewed to its matte, satin, or gloss finish. It Has a Class 1 Fire Rating. 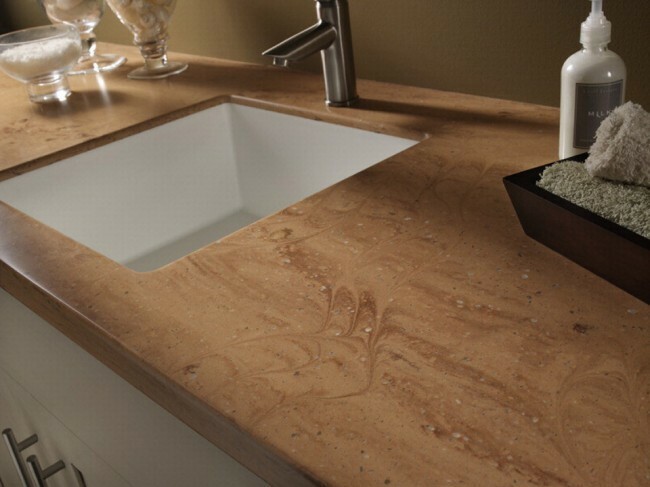 Because you can use most wood-cutting tools with it and color-matching adhesives to glue it together seamlessly, it can provide a surface where wiping food particles into the sink is effortless: a solid surface molded sink can be seamlessly attached as an integral undermount. Stainless, porcelain, copper, or glass sinks can also be undermounted for an appealing and easy-to-maintain clean look.